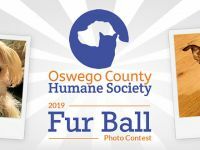 Join us for the annual Fur Ball to support the Oswego County Humane Society on Saturday, April 27, 2019, from 5:30 p.m. to 11:00 p.m.
Music will be provided by Cam Caruso and Millennium Music. Tickets are on sale now at www.oswegohumane.org/furball starting at $60.00 per individual or $100.00 per couple. The Fur Ball is a semi-formal dinner and dance to benefit the Oswego County Humane Society. There will be wine, beer, and spirits tasting, a photo contest, silent auction, and scratch-off lottery drawing. To reserve your tickets for the Fur Ball, please visit www.oswegohumane.org/furball or call 315-207-1070.